I was amazed last year to read many articles on Shellagh’s Day, 18th March. I had never heard of it before. The reports in the Irish Times and other newspapers, said that Shane Lehane, of UCC’s Department of Folklore, reported that antiquarian journals and newspapers from the 18th and 19th centuries talk of a widespread belief that St Patrick had a wife called Sheelagh. “Pre-Famine, pre-1845, if you go back to the newspapers in Ireland they talk not just about Patrick’s Day but also Sheelah’s Day. You have Paddy’s Day on March 17th, and it continues on to Sheelah’s Day. An early reference to celebrations on March 18th, St Sheelah’s Day, is found in John Carr’s 1806 book The Stranger in Ireland. Carr said that on the anniversary of St Patrick the country people assembled in their nearest towns and villages and got very tipsy. Lehane has unearthed references to Sheelah’s Day in the Freeman’s Journal in 1785, 1811 and 1841. There are also many accounts in the 19th-century Australian press of the observance of Sheelah’s Day. So it seems that Sheelagh’s day was once widely recognised all over Ireland as part of the old Irish calendar. Unfortunately, the traditions of Sheelah’s Day completely died out in Ireland, so there is uncertainty as to why this day was actually celebrated. I have looked up many Catholic Saints websites but can find no reference to her as an official saint. Unfortunately there is no evidence to back up this theory. Another theory about Sheelah is that she was St Patrick’s mother. I wonder if there is any link with Sheelah to an old Irish goddess or to the Sile-na-gigs? One of the last places on earth to have it as a major contemporary festival is Newfoundland, Canada. I also found references from Newfoundland of Shelia’s Brush. Late snow storms around St. Patricks day. “Sheila’s Brush is a name used in Newfoundland and it refers to the last big storm of the winter season, a storm that occurs around St. Patrick’s Day. The term comes from an Irish legend which says that Sheila was the saint’s wife (or sister or mother) and that the snow is a result of her sweeping away the old season." This brings to mind the Cailleach and her last fling, bringing winter snow. There are so many layers and stories behind life’s celebrations. Canadian Broadcasting report - what is behind the legend of sheila's brush? Newfoundland has always had strikingly different traditions from the rest of the East Coast, including celebrating St Patrick's Day as a public holiday on the first Monday after the 17th, as a day off for most people, including schools, I believe (but possibly not pubs). I've been aware of the day, hearing it mentioned by friends and co-workers from the island, and heard a passing reference to the storm (you can pretty much count on Newfoundland having snow around now, and well into spring) but even the Irish pubs here in Halifax don't seem to celebrate it. Today, on the Spring Equinox, I woke up to cold and snow (20 F with a wind chill of 10 F, that’s -12 Celsius). My first thoughts were “this is not right, it should be warmer with early spring flowers and birds singing!” I layered up and dutifully went out to feed my horses. 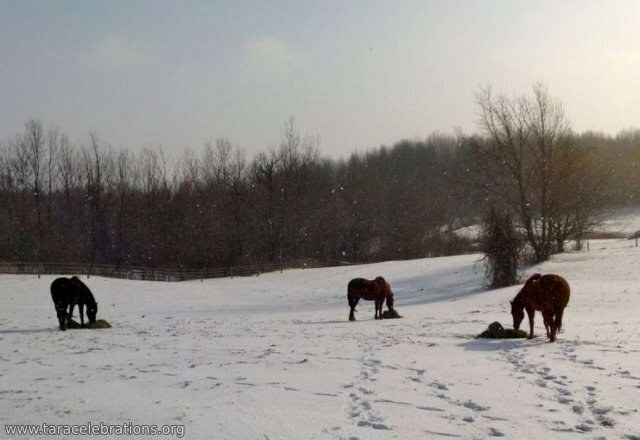 They don’t seem to mind the cold, and after their hay is gone they enjoy pawing through the snow looking for some new green grass morsels.